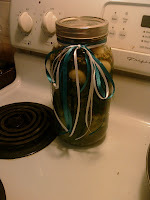 Pack vegetables into 2 clean 1-quart glass jars. In another jar, combine the salt, sugar, vinegar, coriander and garlic. Shake until the salt and sugar dissolve. 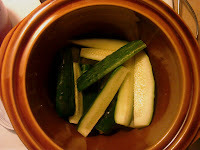 Add 2 cups of water and pour the brine over the vegetables. Tuck the chiles and dill between the vegetables. Add enough water to keep the vegetables submerged. Close the jars and refrigerate overnight or for up to 1 month. Do this until you have the number of cookies that you would like - be reminded that these are not 'light' and you will not need as many as you might think for your number of guests. 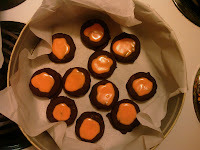 Melt chocolate chips either in a microwave safe, covered container according to melting directions on bag (likely 2 min intervals, stirring in between) OR in a double-boiler on the stove, stirring constantly. Dip each sandwich in the chocolate and spread to cover each one evenly. Place on wax paper covered baking sheet and put into the fridge to cool. Mix together, put into plastic bad, with hole in corner, seal bag and pipe out icing in desired fashion. 1 bag of Trader Joe's halved or pieces and halves Walnuts. Separately, toast the walnuts in a skillet with a little oil on LOW heat to make them golden brown. Another way to do this is to put them on a oven sheet and toast on a low temp 300 for increments of 5 min, flipping them and watching them to avoid burning. I prefer using the stove-top as it's more controlled. 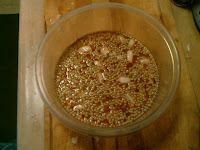 **My first version of this recipe also called for hot sesame oil. If you choose to do this, you can add a few tbs. of the hot oil to the beans after thawing and before adding the cheese. It adds a very exciting and contrasting flavor to the dish. Add the walnuts to the bean/cheese mixture, cool and serve. Lastly, you can serve this hot or room temp - it's enjoyable either way. Oh, and make enough because you'll want to eat this when you're finished with it, in addition to the guests who will want it for leftovers.